Sift the flour and salt into a large mixing bowl with a sieve held high above the bowl so the flour gets an airing. Now break the eggs into the centre of the flour. Then begin whisking the eggs – incorporating any bits of flour from around the edge of the bowl as you do so. Gradually add small quantities of the milk and water mixture, still whisking. When all the liquid has been added, use a rubber spatula to scrape any remaining bits of flour from around the edge into the centre, then whisk once more until the batter is smooth. Now melt the butter in a pan. Spoon 2 tbsp of it into the batter and whisk it in, then pour the rest into a bowl and use it to lubricate the pan before you make each pancake. Now heat the pan and pop in a dollop of the batter, best to do this with a ladle. As soon as the batter hits the hot pan, tip it around from side to side to get the base evenly coated with batter. It should take only half a minute or so to cook; you can lift the edge with a palette knife to see if it’s tinged gold as it should be. 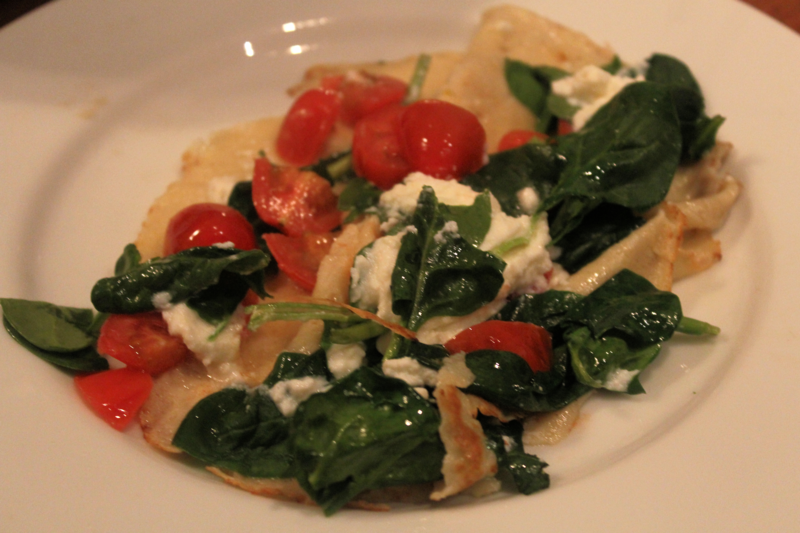 Whilst the pancake is cooking add the chopped tomatoes, spinach leaves and ricotta on top, leave for about 1 minute. Fold the pancake around the ingredients and turn over to heat on the other side. 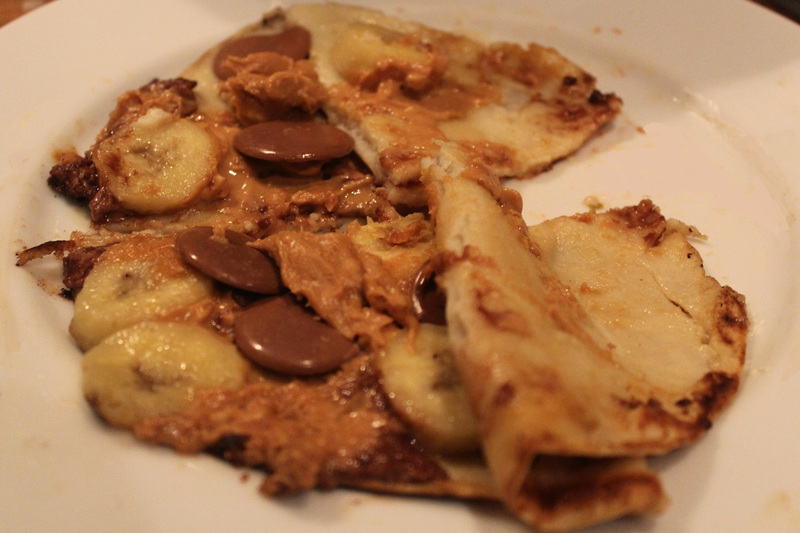 Whilst the pancake is cooking add the chocolate buttons, sliced banana and peanut butter on top, leave for about 1 minute. 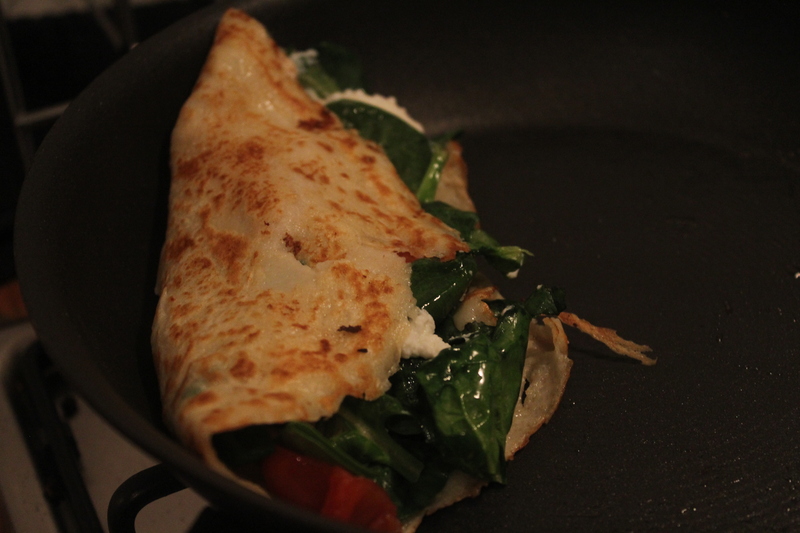 Fold the pancake around the ingredients and turn over to heat on the other side. Use the Organ Buckwheat Pancake Mix – add a packet to 240ml cold water, 90ml milk, 3 eggs, stir into smooth batter and fry it up. If you are going to opt for a simple but sweet topping, then all you need is a dollop of Lyle’s Golden Syrup!